Cormoran Strike is back, but most of his work seems to be with divorces and cheating spouses. He’s out all night tailing people and collecting information for his clients. Out of stubbornness, he takes on a missing persons case. Author Owen Quine has been missing, but no one except his wife seems concerned. As Strike begins to ask questions, he realizes there is more to this case than a missing person. Which soon turns to a case of murder. 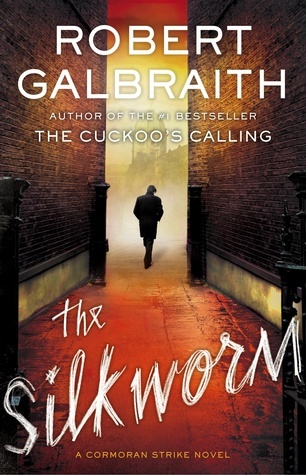 The Silkworm takes us into the dark world of writing and publishing. Strike is a methodical detective, collecting information and slowly putting the puzzle pieces together. In this second outing, Strike and his assistant Robin have a good working relationship going. They compliment each other, and the office is running smoothly and busily (due to Strike’s notoriety from the Luna Landry case). There is a bit of unrest as Robin would like to become a full-fledged investigator instead of merely the office admin. I liked it, but not quite as much as The Cuckoo’s Calling. I think I just enjoyed the mystery and characters of that first novel better. But I’ve heard that others have thought The Silkworm was better, I imagine due to the character development of both Strike and Robin, which I did enjoy. Looking forward to reading the third book.